Having enjoyed the first book — and still being peer-pressured within an inch of my life — I was quick to borrow the second book of Brandon Sanderson’s Stormlight Archive series, Words of Radiance, from my friend. I enjoyed this book more than its predecessor. Words of Radiance improves on many of the strengths of The Way of Kings, and polishes some of the flaws, though it doesn’t erase them completely. 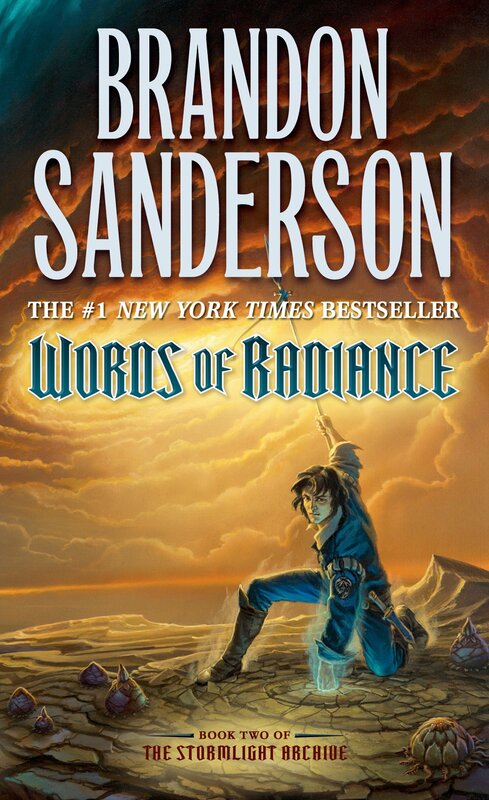 Words of Radiance sees Kaladin and the bridgemen saved from their brutal life of slavery as they now occupy a place of honour as guards in the employ of Dalinar Kholin, but the political intrigue of Alethkar provides threats of its own, and Kaladin’s personal demons threaten to rob him of everything he’s achieved. Meanwhile, Shallan must begin to find her own path as she finds herself separated from her mentor. For the most part, this is the same sort of experience Way of Kings was. That is to say a very traditional but highly competent high fantasy. It’s not surprising, and it’s not innovative, but it is entertaining. The plot is compelling, the setting is interesting, and the characters are deeply likable. Near the end, it also boasts one of the most insane action sequences I’ve ever read. I wish I’d written it. The flaws of the past book have also been at least partially addressed. Shallan has become a much more compelling character, though she’s still not my favourite, and her plot is too reliant on withholding vital information from the reader. There’s a semi-decent explanation for this within the story, but it still feels cheap. The pacing issues have also improved. Words of Radiance is not nearly so glacial as Way of Kings was, though it does still have the problem of more happening in the last 1-200 pages than the first 1,000. I also didn’t find the writing got so bogged down in irrelevant details this time. Or maybe I just got used to it, but there didn’t seem to be as much wasted prose this time. On the downside, some new issues have arisen. The newly introduced romantic arcs are as lifeless and predictable as you would expect from such a classical high fantasy, and the fact it all seems to be headed towards yet another love triangle is making me physically wince. But those are ultimately minor criticisms of what is for the most part an exciting, fascinating, and at times inspiring read. This series remains a strong recommendation for fans of old school high fantasy. This entry was posted in Reviews and tagged books, fantasy, review, The Stormlight Archive by Tyler F.M. Edwards. Bookmark the permalink. Sanderson is kinda known for a long build-up and then the “sanderlanche” in the last 100 pages or so of all of his books. I don’t mind it, per se, but I do find it makes it a little harder for me to re-read whole books of his, I tend to just read the final 100 pages of the “sanderlanche” instead. IMO, his best work is actually a novella — The Emperor’s Soul. It’s long enough to have some neat stuff in it, but short enough that the whole thing is essentially “the sanderlanche” so it’s good all the way through. Heh, “Sanderlanche.” I like it.